radio afrique is a sublime monthly gathering celebrating the diversity and richness of music found in the various regions of Africa. 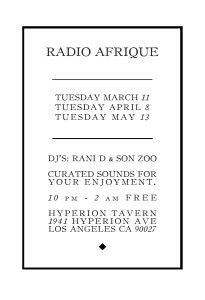 desert blues, angola soul, ethio jazz, and nigerian disco are some of the genres we’ll be amplifying on this special night. we’ll also be connecting the dots and highlighting the cross-pollination in music with other parts of the world. we invite you to join us in creating a space for this music to be heard and felt.